In 1915 James (Jim) McClelland was born into a working-class Catholic family. He followed in his father’s footsteps, taking work on the railways. There he was introduced to left-wing politics. Initially attracted to Marxism, McClelland soon came to doubt that Marx’s theories could be applied in reality. McClelland served in the armed forces during World War Two and after the war, studied law and opened a practice in Sydney specialising in industrial relations. Always politically active, Jim McClelland played an important part in Australian politics during the 1970s. He was elected to the Senate in 1971 and the following year became a Cabinet Minister in the Whitlam Labor Government. 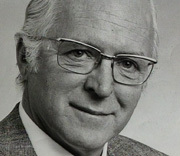 ‘Diamond’ Jim McClelland retired after seven years in parliament and was appointed to the bench of the NSW Industrial Commission. He later became Chief Justice of the NSW Land and Environment Court and headed the Royal Commission into British atomic tests at Maralinga. He had a close involvement with the media as both a commentator and columnist. He was a champion of media independence and remained active and outspoken on a number of issues until his death in 1999.